Cairns Jazz Club president, champion of the Yacht Club and local JP, Rob Williams, pens a few notes to Bob Katter MP and his media manager, the Cairns Post. Williams believes they might like to absorb some facts and allow it to screw up their story about indigenous housing on Cape York. The headline infers that builders get $600,000 per house when in Cairns you can get a bigger landscaped house for half that price. The houses on Mornington were financed by the local Mornington Shire Council. Mornington Island is an Aboriginal community and permission to land on the Island must be sought from the Mornington Shire Council by mail, six weeks prior to the intended visit. There is no guarantee of permission being granted. To build anything on Mornington Island a builder has to transport all building materials, even sand. Cairns to Normanton is 1500 K round trip by semi trailer. Normanton to Mornington Island is 340 k round trip by barge. Parts of the Gulf Savannah region suffer from a lack of road infrastructure 6 months of the year you can’t get anywhere near the coast with a heavy vehicle. Want to fly there and see how your project is going? You won’t get any change out of $850. The design is dictated by the Mornington Shire Council and the indigenous people themselves. Mornington Island is surrounded by shallow sea. The Island has no raw materials on it. Everything has to be barged there. The Barge company has to wait for the right tides to get anywhere near the unloading ramp because it is so shallow. If they get stuck they may have to wait for days before the tides gets there again to float them off. Else they have to unload onto smaller craft whilst at sea. This requires a crane. The building company has to tender for the project and wait, sometimes months for a confirmation that doesn’t have any provision for an increase in costs. Every builder that tenders for housing projects has to foot the bill for all the expenses involved in producing a price, working plans, project time lines etc. and expect they may not win the tender. The cost of jumping through the hoops for builders is ridiculously expensive with, guarantees and insurances, if they miss the contract they have to make it up next time. The builder has to employ at least one aboriginal person as an apprentice. This condition does not apply to your $300,000 house in Cairns. 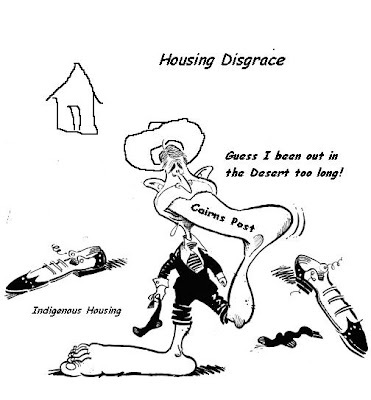 Housing for aboriginal tenants has to be built with one eye on the fact that some do a lot of damage to the buildings. The Mornington Island community has been described as the toughest in Queensland when it comes to resisting alcohol bans. When some of the residents can’t get their way with alcohol, they riot and they take it out on their houses. Mornington Island is in a Cyclone prone area so the comparative building in Cairns showed on the front page, is not practical out in the middle of an area permeated in salt air. Air conditioners often last only six months, then rust out. Cyclones routinely hit the island. In 2000, Cyclone Steve passed directly over the island. Tropical Cyclone May passed in February 1988 and Tropical Cyclone Bernie passed to the west in early 2002. Tropical Cyclone Fritz passed directly over the island on the 12 February 2003. Severe Tropical Cyclone Harvey caused damage on the island in February, 2005. The landscaped home you showed belongs to a house proud family that planted their own garden. On Mornington, the contractor built fencing and landscaped the houses. Lawns and plants die from lack of watering. Mount Isa to Mornington by road and barge is 1,340 klms. If aboriginal people want to live in a house in Cairns like the one you showed, they should come here and buy one. They get millions in government assistance. So in summary, why waste time and money on Mornington Island? leave them to their own devices. We have more than enough opportunities to piss away money here on the Mainland (see first article about Taipans and Council for an example).